A man on the run after a warrant was issued for his arrest over a messy garden claims his possessions are being stolen. 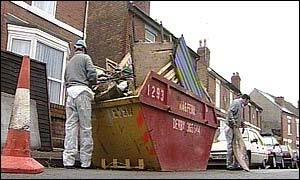 Graham Ellison made the accusations after council workers and bailiffs moved into his house in Alvaston in Derby. Mr Ellison, 44, is liable to pay £15,000 in fines for not cleaning up his property. The city council took him to court following eight years of complaints by neighbours who say the piles of rubbish are a health hazard. It is expected to take workers well into next week to complete the job. Bailiffs have been unable to find him Mr Ellison. But he agreed to speak to the BBC on Friday saying: "How would anybody feel if the contents of their garden which they have collected or salvaged over a number of years were literally being stolen, it is not nice. "I have made a number of offers about reducing the impact and none of that was acceptable to them. "For the past two years we have been arguing about this and they have refused to accept anything other than a total clearance of my garden. "There was no justification whatsoever for totally cleaning my garden if they were not prepared to discuss a lesser job." Among the litter were abandoned building materials, motorbikes and domestic appliances. Councillor Sara Bolton of Derby City Council said: "I have been on the council for 16 years and this is the worst case I have ever seen. "It is appalling the neighbours have had to put up with such a mess for so long." Workers found newspapers that dated back to 1974 in the property. Whilst clearing the site Nick Manning, one of the contract workers said: "The problem with these sorts of properties is that they are breeding grounds for vermin." Mr Ellison who runs a wheelbarrow making business, had previously been given a sentence in his absence at Derby County court and ordered to pay costs. Neighbour Debbie Poulter said: "At the end of the day all I wanted him to do was tidy up the front garden and cut his hedge and it would not have come to this."